With the Rain Shovel your child can play and experiment with both water and sand, which makes it the perfect toy for the beach, playground or garden. 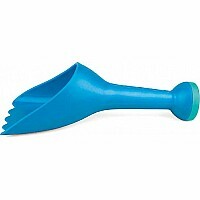 The multi-functional Rain Shovel can be used to collect, carry and sprinkle water or dig, carry and sprinkle sand, and features an innovative design. Made from high-quality, durable materials. Includes a five year guarantee. Suitable for children aged 18 months and up. Measures approximately: 9.45 x 4.72 x 3.15 inches..